103 Cane Cutter Road home is located on a large corner, park view site. At 4,195 sq ft, the plan features a two-story foyer, large great room/dining room comb., custom kitchen with walk-in pantry, and a screen porch. From the 2 -+ car garage, the ownerGÇÖs entrance opens into a large mud room/laundry with built-ins and storage. The large first floor master suite has two walk-in closets, a separate tub and shower, and two separate vanities. The second-floor family room is central to three guest suites each with private baths. A fourth guest suite is located above the garage. Detailed trim and thoughtful selections make this home feel custom. Fantastic investment opportunity in West Wilson at Palmetto Bluff! 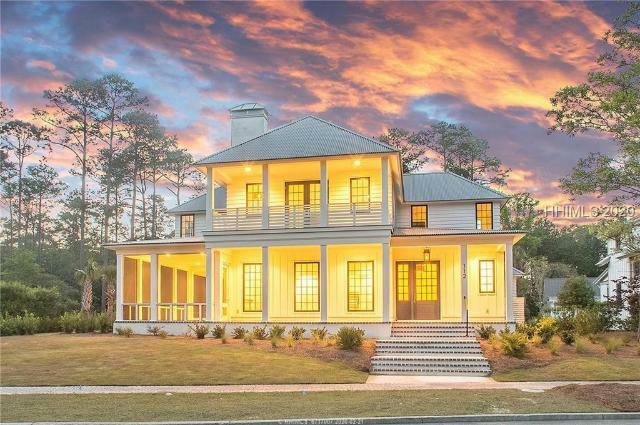 Constructed in 2006 by JT Turner, this home is stroll friendly to all Palmetto Bluff has to offer. Situated on a large lot at the end of the cul de sac, this amazingly private location offers a nice shady canopy providing a lush setting overlooking the first fairway of the May River Golf Course. Interior layout offers an open kitchen and living space concept featuring a lofty vaulted ceiling with exposed beams upon entering the home, master suite on the main level, 2 bedrooms en suite upstairs and a 2 car garage with workshop and unfinished studio apartment space on 2nd level. Located in the heart of the West Wilson neighborhood of Palmetto Bluff, 62 Blue Willow Street is a comfortable home that also offers a fantastic rental opportunity. The ideal 4-bedroom, 4.5-bathroom floor plan includes a gracious living area and two master bedrooms. A screened porch with fireplace and an open porch/patio with views of May River Golf ClubGÇÖs 1st hole invite you to enjoy the best of outdoor living. Walk or bike to the Wilson Village pools, wellness centers, tennis courts, golf course, shops, and restaurants. This beautifully-decorated home is being offered furnishedGÇöready for immediate use as a second home and short-term rental. 19 North Drayton Street is a 2,149-square-foot home in Wilson Village with four bedrooms, three-and-a-half bathrooms. With ample natural light, this home offers Lowcountry detailing with shiplap walls and well-maintained hardwood floors. The master suite and a guest suite are located on the first floor while two bedrooms and a full bathroom are on the second. This home is centrally located within a short distance of the amenities in Wilson Village and is also eligible for the home rental program, making it the ideal place for full-time or part-time residents. Centrally located West Wilson home in Palmetto Bluff!! With 4 bedrooms and 4.5 baths, this open concept home is perfect as a vacation or primary home. It features Viking appliances, a wet bar, beamed ceilings, reclaimed wood floors, 2 bedrooms on the main floor and a large screened porch. Although the home is not currently on the rental program, it can be place on the short term rental program - it has the perfect layout and location for guests. Plus, the home has a fully fenced back yard with a two car garage. Being a short walk to pools, tennis, hiking trails and more, the home is the ideal place to explore all Palmetto Bluff has to offer. Located in the River Road community of Palmetto Bluff, 5 Crossbow Rd. is currently under construction and will be ready for move-in by spring 2019. Built by Vala & Owens and designed by Pearce Scott Architects, this 4-bedroom home epitomizes Lowcountry living and includes a custom landscape/hardscape plan. Enter the open foyer and great room via a covered front porch, and enjoy a keeping room with fireplace and French doors opening to a screened porch. Other highlights include 8GÇ¥ French oak flooring, custom built-ins, and custom lighting. Master suite and second bed/bath are on first level with 2 ensuite bedrooms and flex space upstairs.